Born into a noble family in Ghent, Belgium, Joseph Charles de Blezer travelled to Paris to pursue a career in sculpture and the decorative arts. He studied at the École des Beaux-Arts with Jean-Baptiste Clésinger and exhibited regularly at the official salon from 1863 to 1881. De Blezer’s colossal plaster bust of the great American abolitionist John Brown (1800 - 1859) was exhibited in the Salon of 1870. 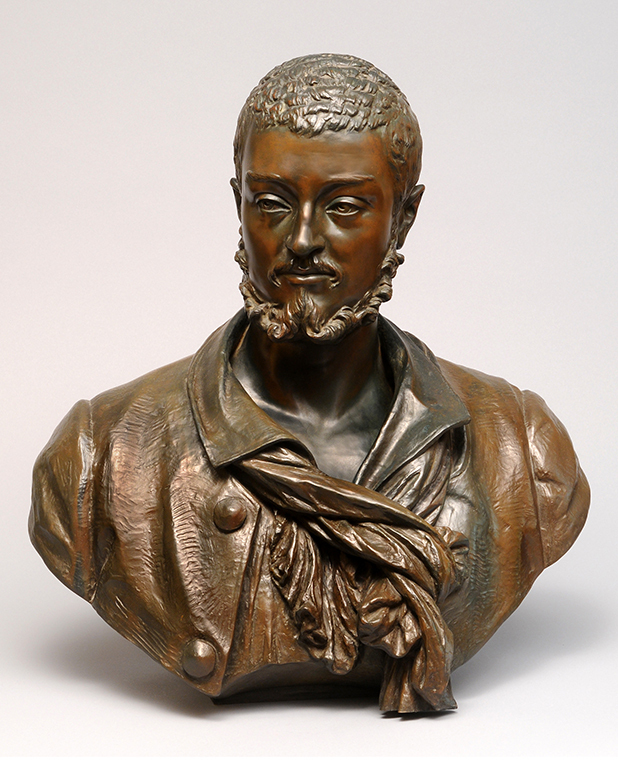 A bronze cast of this work was purchased in Paris in 1976 by a trustee of Oberlin College. It was a gift to the college, where it remains on view to this day. Our bust of a handsome mulatto was, perhaps, inspired by the abolitionist movement in the United States and in France in the mid-Nineteenth Century. In it de Blezer used a compositional device similar to the one used in his portrait of John Brown; however, instead of a rope wrapped around the collar of the shirt, there is a scarf loosely draped around the unbuttoned collar. The young man stares directly at the viewer, with a look of confidence. He appears to be a man of quiet elegance and is depicted by de Blezer in a manner that recalls the work of the Renaissance sculptor Alessandro Vittoria (Trent 1525 - 1628 Venice).